As of January 2017, the current world population is 7.5 billion. It’s impressive, isn’t it? But how many more could we potentially have if we could add all the split personalities we could have managed to count? The number would have certainly increased. 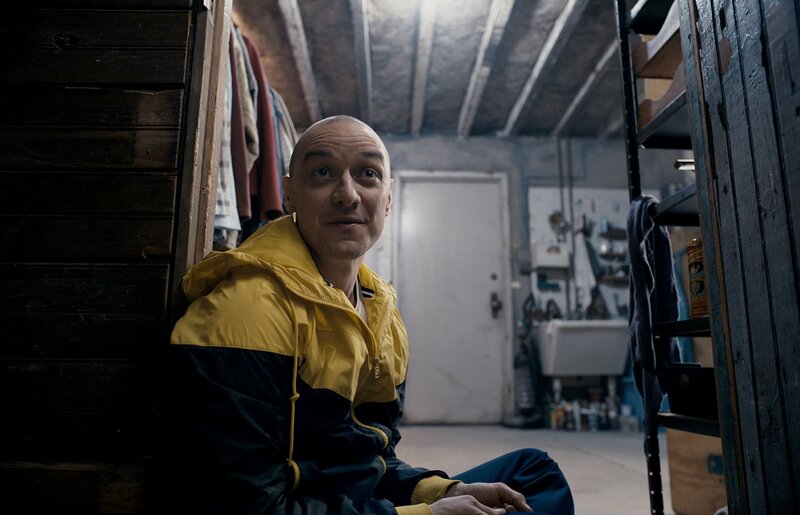 And that, I must say, is the best thing in M. Night Shyamalan’s SPLIT, when it leaves you in the end not to hang on the storyline itself, but on its quite intriguing concept, where you know each personality belonging to James McAvoy`s Kevin had been real, dangerous and rich. A Man named Kevin has 24 personalities. One of them, called Denise, abducts three teenage girls, Claire, Casey and Marcia right from a car. Finding themselves in an unknown place and realizing that the man who has kidnapped them suffers from multiple personality disorder (DID), they figured that it’s better to find a way to become closer to some of them, who could potentially release them from captivity. However, each time when they plan their next move, they realize it won’t be that easy to escape him. Dennis (James McAvoy) is the most controlled personality that Kevin, a real personality that will be briefly seen, possesses. He is more intelligent, cold-blooded and calculated ‘person’. As the story unfolds, you will get the chance to learn more about Kevin’s other personalities, such as Patricia, Hedwig, the Beast, Barry, Orwell and Jade. But there are more, lucky or not, we won’t get a chance to find out, as you will be having enough stress to handle throughout the movie, as you allow yourself to grasp each of them one by one. When the movie begins, we find all three girls celebrating a birthday. Casey, in fact, did not plan to join her girlfriends after their little gathering, but was insisted by her friends. Shortly after, it will be revealed that Dennis did plan his course of action carefully and his intention was to have only two victims. However, and that was the negative side of the script, after sometime, it’s Casey who will be left alone, still having her other friends alive to face Denise’s yet another dangerous personality, The Beast. Even though the movie itself begins with promise, the flat screenplay, lack of intensity and being too long might disappoint some viewers. That may not destroy the entire positive impression from the film, as from the acting point of view it was simply stunning. James McAvoy’s ability to portray multiple characters made me wonder, what if he also has a multiple personality disorder? Obviously, he does not. But it is a great feeling when you have to ask yourself those kinds of questions just because of a brilliant performance delivered by McAvoy. My only complaints about the movie was its length and editing. At some point you will realize that the movie would have been more impactful if Shyamalan would have gotten rid of some unnecessary scenes. He also, for obvious reason, makes Casey a female protagonist character, while her girlfriends remain victim, but less important ones. Due to some choices the director made, it had a huge impact on the movie, but despite that it will still delight you in the end. In the end, the film asks a very important question: should all personalities that Kevin has, be taken seriously? Or why can’t they? But until the time to answer that question, it will be relevant to see SPLIT for peace of mind, because it’s whether I liked or not, is a mindful piece of art.